We have two pit bulls, Rosco and Reagan. Rosco is four years old and Reagan is five. We have had our dogs since puppies although had never formally trained them. We had always tolerated their bad habits that included jumping up, trampling visitors, pulling us on walks, escaping out the front door and running down the street, jumping our five foot fence, barking at passers by, displays of dog aggression, and the list went on and on…! With the expectation of the birth of our first child this summer, we realized that these behaviors would not only become overwhelming, but had the potential to become unintentionally dangerous to our baby. So, after searching through lists of crowded, kennel-type training programs, we came across a different approach offered through Indiana Dog Trainer. After just a few weeks of very personalized training within their residential facility, our “new” dogs returned home. While realizing our responsibility in continued training, we are also overjoyed with our much improved relationship with our dogs. And Don't Forget Abby... Their Pet Skunk! We still have fun and play, although feel comfort in our new-found leadership and control. 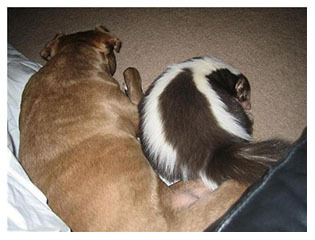 It is also evident that our dogs (and our pet skunk, Abby) feel the same way. We only wish that we had not waited so long! We would very highly recommend Indiana Dog Trainer to anyone looking for a rich and fulfilling life with their dog. Here at Indiana Dog Trainer we feel that there is greatness in every dog. 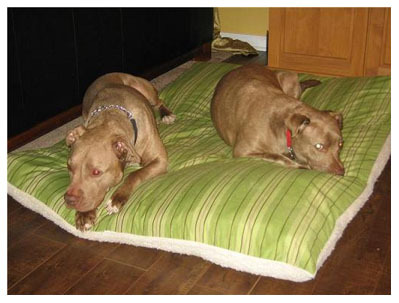 If you would like to see how great your dog is contact us for a free consultation.